Societe Generale has mapped out the world by each country’s place in the global debt cycle. 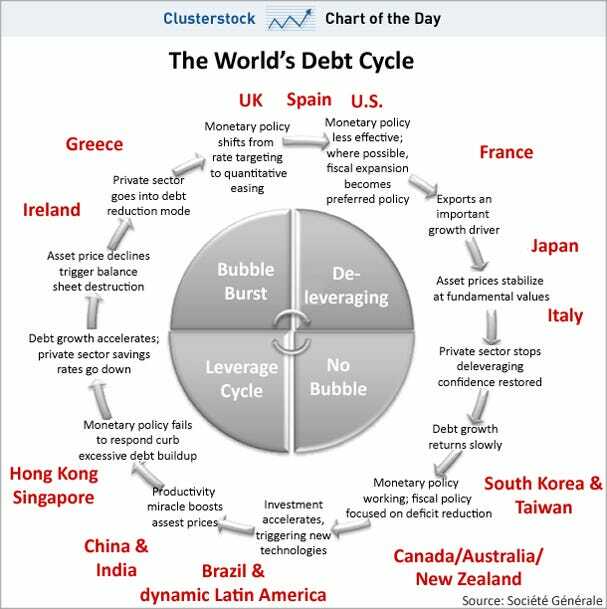 The cycle starts with countries paying down debt, followed by growth with little debt, then a rapid increase in leverage, closing with the bubble bursting. Every major developed country fits on a part of the chart. Right now, the U.S. is starting over, paying down debt and a long way from the growth portions of the cycle. At the opposite end of the spectrum are Brazil and China, ramping up growth and increasing debt. Might be a good graph to follow if you’re someone who plays the markets by country.